Enteroviruses are a collection of viruses (the correct term is genus) within the family Picornaviridae. Enteroviruses include polioviruses, rhinoviruses, Coxsackieviruses, echoviruses, and other enteroviruses like enterovirus D-68 (EV D-68) and enterovirus A-71. These viruses cause medically important disease such as poliomyelitis, the common cold, hand foot and mouth disease. 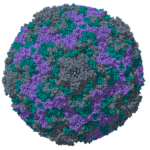 Enteroviruses are small, spherical viruses made up of an RNA genome surrounded by a protein shell. These viruses lack a membrane which is typical of influenza viruses. A model of the EV D-68 virus particle is shown at left. 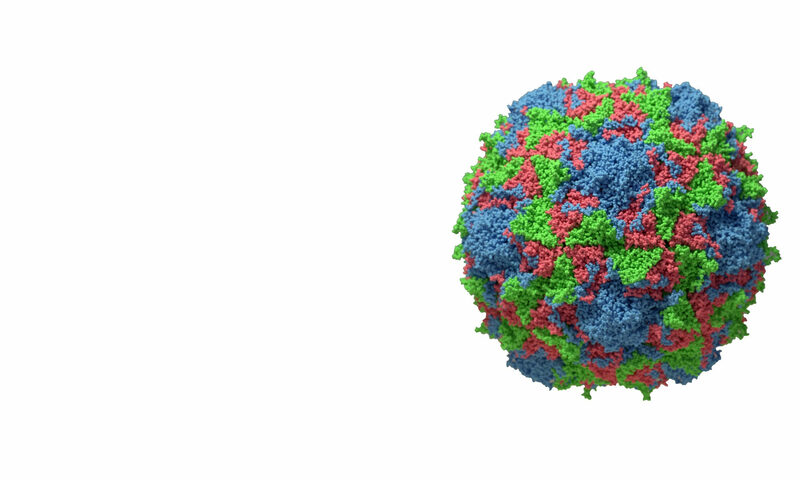 You might be wondering why rhinoviruses are included in a genus called enterovirus. This genus was first named many years ago based on the ability of poliovirus, Coxsackievirus, and others to infect the intestinal tract. Much later it was realized that the genome of enteroviruses and rhinoviruses were highly related, and therefore rhinoviruses were added to the genus. It is a bit confusing because rhinoviruses do not infect the intestinal tract, such is nomenclature. Poliomyelitis, which once paralyzed hundreds of thousands of children in the world each year, is on the verge of eradication. An intense global immunization campaign begun in 1988 has lead to less than 200 cases of paralysis each year. Many of these cases are in areas of the world in which armed conflict prevents immunization. More information on polio eradication can be found at polioeradication.org. Other enteroviruses cause many millions of infections each year. These viruses may cause infections of the skin, muscle, and the brain and spinal cord. Infection of the latter can cause meningitis, encephalitis, and paralysis. Recently outbreaks of enterovirus D-68 have occurred that are associated with paralysis. This virus, first isolated in 1962 from children in California with pneumonia, caused the first outbreak of severe respiratory disease in the US in 2014. A small fraction of children infected with EV D-68 developed what is called acute flaccid paralysis (AFP). This condition was originally defined by the World Health Organization as sudden onset of paralysis or weakness in any part of the body in a child under 15 years of age. There can be many causes of AFP, including infectious agents and neurotoxins. Most enteroviruses are not well studied in research laboratories. Consequently there are no available antiviral drugs or vaccine. Our laboratory investigates EV D-68 and rhinoviruses; descriptions of our research can be found in the Research section of this website. A second outbreak of EV D-68 in the US occurred in 2016, also associated with AFP. As of this writing, in the fall of 2018, a third outbreak of AFP in the US is ongoing. This outbreak appears to be associated with EV D-68 and EV A-71. A subset of AFP cases are called acute flaccid myelitis (AFM). In AFM, it is presumed that there is injury to specific neurons in the spinal cord.